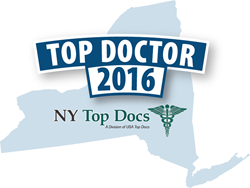 Dr. Ellen Burov was recently reviewed and approved as an NY Top Doc. Recently reviewed and approved as an NY Top Doc, Dr. Ellen Burov is a board certified dermatologist specializing in general and cosmetic dermatology offering expert skin care to men and women of all ages. In addition to general medical dermatology services, she provides a range of cutting-edge options for attaining smooth, soft skin and a healthy-looking body through her aesthetic program, cosmetic procedures and laser expertise. Certified by the American Board of Dermatology and a member of the American Academy of Dermatology, Ellen Burov M.D. has been listed in “America’s Top Physicians” since 2003. Dr. Burov currently holds an academic position as clinical assistant professor at Albert Einstein College of Medicine. Dr. Burov’s practice is dedicated to both cosmetic and general dermatology with a focus on rejuvenation and optimizing skin care routines. She has been a recipient of the Patient’s Choice award since 2008. Dr. Burov has a number of presentations and papers; she was featured in “Skin and Allergy News,” “Manhattan Women’s Journal,” “Cosmopolitan” and in other public media. Our wide range of cosmetic procedures addresses every level of aesthetic needs from improving skin texture to restoring lost facial volume and treating cellulite and hyper-hydrosis. The practices utilizes state of the art lasers such as Palomar for photo-rejuvenation, skin tightening, hair removal, leg vein treatments; Cynosure Precision Tx laser for neck contouring and lower face lifting, treatment of cellulite and hyperhidrosis.